The word is apt to render the gripping scene of war in the name of the sugarcane wine basi. That war raged in the 1800s in the Ilocos, the northern republic of the archipelago, where warriors risked their souls for the spirit they imbibed at breakfast and in the wakes of their dead. The Spanish government wanted to control the heady substance, ostensibly to prime the costly colonial enterprise; the Ilocanos would however not let invaders touch the libation. Headlong is such an interesting term though. It means rash, precipitate, impetuous as if no thinking informs a surge. It is also, on the other hand, what it visually evokes: head first, meaning that no surge could ever happen without heads being reared. 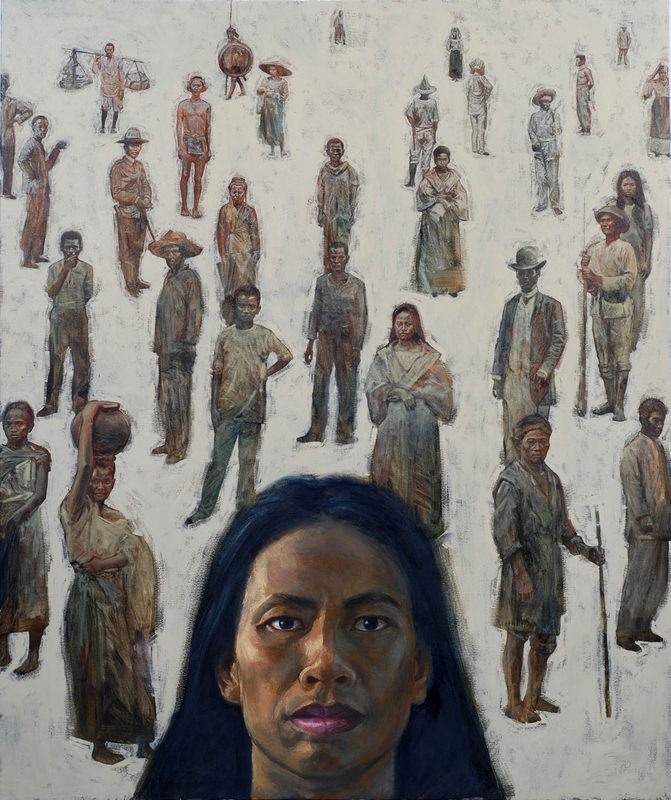 Antipas Delotavo paints this surge, fulsomely and with the passion that stirs a partisan heir to history to paint its animus. And yet, he also limns the fiery moment with a kind of hush, index of both the sublime and the necessary contemplation, the visceral response to a radical possibility, intense in its proximity, on the one hand, extensive in its implication and speculation, on the other. Between the immediacy of contact with historical detail and the mediation of thought in figuring it out is the sensible, sensitive impulse to relive the moment, to make it present again urgently. There is, to be sure, a pictorial conjuration here of the sonic frenzy of battle, the din of fervor and sacrifice hovering over the natives, battle-ready in their prominent head gear of revolution. The site of this bloodbath is the Bantaoay River where Spanish and Ilocano forces waged a fight to the finish. Fluttering in this charged air is the uncanny flag of the Ilocanos that mimics the colors of the Spanish red and yellow. Another level of sound could be felt as well: the rustle of fabric, of the Ilocano textile that captures light and shadow and creates folds across this breathtaking mural. In a way, this layer of cloth serves as the second skin of the painting, a kind of drapery that overlays the pictorial sprawl as the mural unravels, so to speak. A central character in this dramatic scenario is the pregnant woman in the foreground, standing her ground amid the tumult, bearing witness to an event that terminates an old order and presages a new, unknown one. This telling trope anticipates a birth that is conceived in struggle, and it summons previous articulations in the artist’s corpus that invests textile not only with visual interest but also with the character of a divination, or limns a persona who is a proletariat or peasant mediatrix attending to the bodies of revolutionary martyrs. The artist devotes almost the entire space of the mural to a compelling surge towards the right, reminding us of the well-known panel of Carlos Francisco titled Filipino Struggles Through History in which Andres Bonifacio leads his soldiers in an attack, bolo in one hand and pistol in the other, arms outstretched as if to mark the horizon along with a crimson flag. In the Francisco painting, the revolutionaries are arrayed dramatically, their heads rhythmically terracing as they advance with their bamboo spears and run over a slain enemy. Around the scene are clouds and flame that ensure the fluid flow of the images from episode to episode like in a film. Such a template might also recall the image on the façade of the church in San Joaquin in Iloilo, built from 1859 t0 1869. It speaks of the military success of Spanish forces over the Moroccan (Moors) army at the Battle of Tétouan under Mohammed IV of Morocco in the final battle of the Spanish-Moroccan War in 1861. As the king and a painter in his court are insinuated in this scheme, Delotavo is able to surface the other inspiration of this project: Esteban Villanueva’s fourteen-panel series on the Basi Revolt and its possible folk colonial cosmology, the Passion of Christ itself as rendered in the Via Crucis or the Way of the Cross. At this point, the category of painting becomes unstable and potentially incendiary. As a medium through which history is thought, it ceases to be merely reflecting an incident that leads to a protracted war; it becomes a basis of chronicle, portent, and allegory. As art, it is actually primary datum, as it were, a production of history and a history of art. This mural does not exist in isolation. 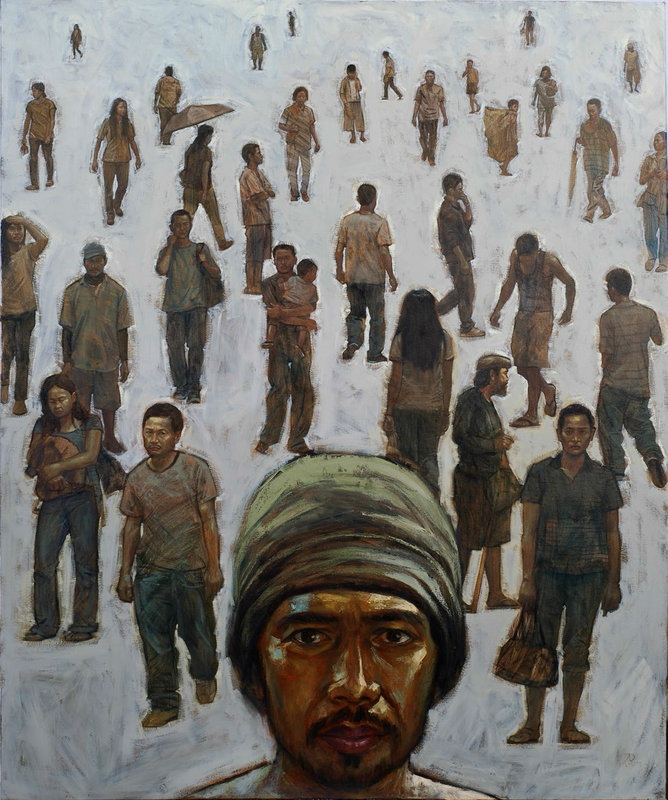 Along with it are paintings that refer to the broader preoccupations of the artist about the difference between generations of Filipinos, or more specifically, about the circumstances they find themselves in that form their responses to the pressure or the obligation to create history in the image of their aspirations. They are basically portraits, haunting visages of people, gazing or posing, carved out individually and carefully composed in a pyramidal scheme with one dominant face in the foreground. They are also caught in certain stances, going about their everyday errands or enacting the habits to which they have been inured. They may convey a sense of catatonia or malaise. But such an impression may also actually be ominous, the calm before the storm that manifests in seemingly blank stares and banal demeanors. Finally, Delotavo includes an installative work that weaves the strands of his poetic gesture and his political response to the colonial experience and its contemporary consequences. 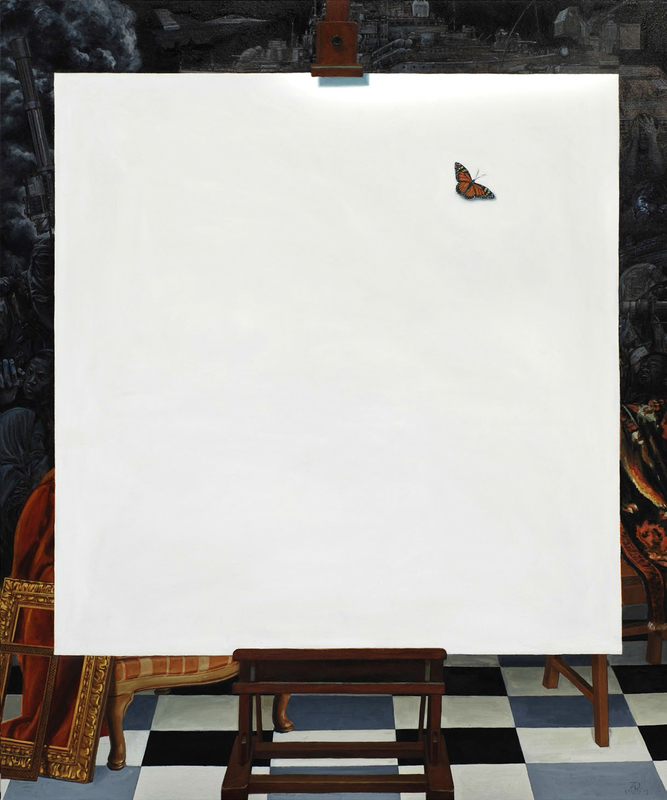 It consists of a painting of an empty canvas, a mise-en-abyme, in which the untouched ground of art is marked by the image of a solitary butterfly, a trace supposedly of the dead returning to the earthy plane to make the living not forget. It is a stark emptiness, but surrounding it are black-and-white images of machines of war that shatter the stillness of the kind of art that is yet to be consummated. 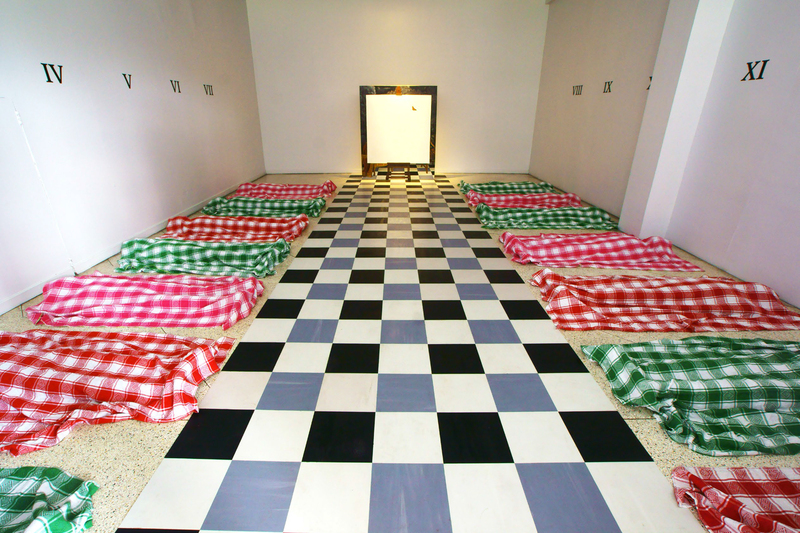 This painting spills onto the floor, with the tiles, signs of sleek but decadent affluence, turning into actual objects that become ground for figures covered by the Ilocano weave or the abel. There are fourteen of them, presumably signifying Villanueva’s exceptional opus, only that the painting is displaced across an assemblage of corpses, a memorial not to the painting’s number but to the rebels who had died and everyone else who had immolated themselves for country. The folds of the fabric that shroud the fallen have become both motif and material in the imagination of the artist. In the exhibition Lagaslas: Mga Huling Gawa sa Tubig Kulay in 1992, for instance, the murmur of the delicate medium is enfolded into the dappled surface of cloth that sort of hisses. Boime, Albert. 2004. 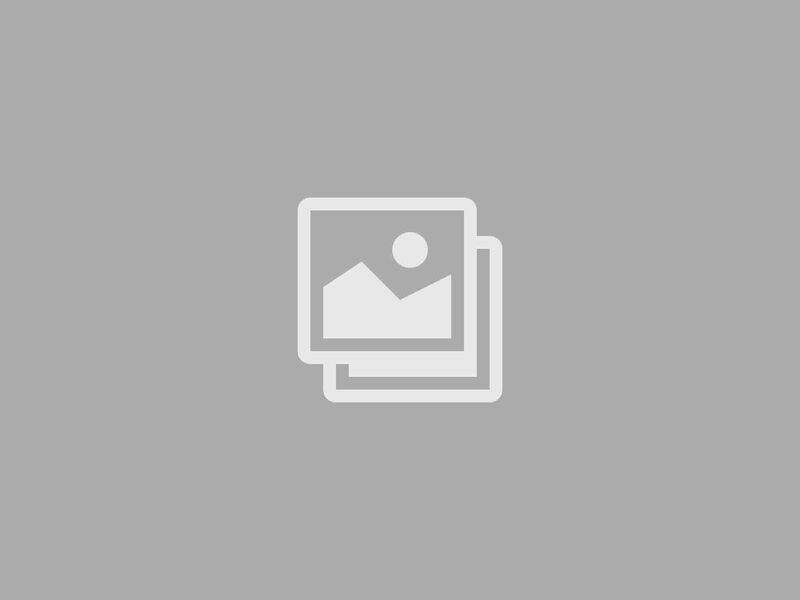 Art in an Age of Counterrevolution 1815-1848. Chicago: University of Chicago Press, 98. Cannell, Fenella. 1999. Power and Intimacy in the Christian Philippines. Cambridge: Cambridge University Press, p. 223.